A spokesperson for Olympus has indicated that the next camera the company releases will be in the PEN line-up, rather than an expansion of the new OM-D line. Although the E-M5 has only just been announced, it is the first camera in the OM-D line-up, so some are already anticipating what the next camera will be. However, speaking at the European launch of the new camera, Olympus Japan's Toshiyuki Terada said, "Looking at product lifespan, I think the next issue will be a new PEN." "We like to see the market feedback, and we always look to see the next camera in the marketplace." The current Olympus PEN line-up, comprising of the E-P3, E-PL3 (Pen Lite) and E-PM1 (Pen Mini), was only introduced in the middle of last year, but previous release cycles for PEN products have turned over pretty quickly. Therefore, it wouldn't be unreasonable to expect at least one new PEN body during 2012, perhaps using some of the technology now featured in the E-M5. 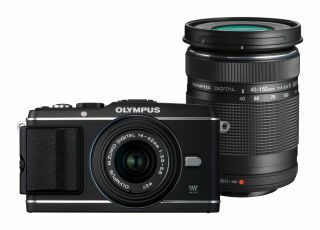 It seems pretty unlikely that any new PEN will feature an inbuilt viewfinder as Olympus is maintaining that the OM-D is a separate line-up from the PEN series, with the bigger form factor which allows for the viewfinder being one of the key differences. Keep following for more details on any releases as and when they happen.